This plant has a set of names, the majority of which are used on an equal basis with the conventional botanical terms. The scientific name sounds as Nigella came from the Latin word "niger" that is translated as "black". Most likely, the name was given on the corresponding coloring of seeds, which curative property was known still in the ancient time. British often call this plant "Blossoming, or Wild fennel", "Black caraway seeds", "A muscat flower", "The Italian coriander", and also such a poetic name, as "Love in fog" is very popular. Russian-speaking society and Americans call Nigella as "Chernushkaya" more often or, having followed an example of "English poets", "The maiden in greens" and "Hair of Venus". All these names underline not only surprising as often note, intelligent and gentle beauty of a plant, but also extraordinary useful properties of its seeds which many centuries are widely used in cookery, medicine and perfumery. Nigella. 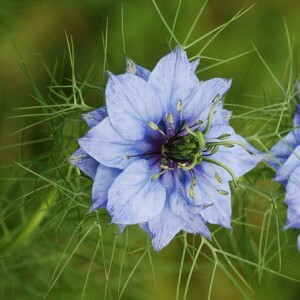 Nigella cultivation. Garden encyclopedia.